The Renaissance Man ALWAYS wears a great watch! In line with the theme of the Renaissance Man, I thought I’d talk about the best accessory a man can have – a watch. It’s been said that when a woman looks at a man, there are two things they notice, the shoes he wears and the watch on his wrist. These items usually tell them where a man is in his life and his career. Like cars, watches and shoes are status symbols. 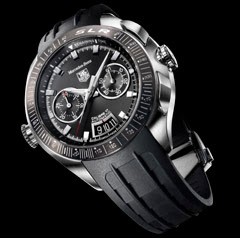 Tag Heuer watches have been world renowned since 1860. Known for its ability to combine classic and avant garde designs, as well as technologies, the brand continues to be recognized as one of the best when it comes to quality, prestige and performance. One of the most recent updates to Tag Heuer’s chronograph line is in the Tag Heuer SLR for Mercedes Benz. These two prestigious brands have been inseperable since 1985. Together they inspire each other to build great cars and great watches. The first version of this watch came out in 2004. And 4 years later it looks even better. Definitely a car and watch collector “must have”, this limited edition piece (3,500 pieces produced) showcases a lot of precise details. In terms of design, this watch definitely combines sport with elegance. The natural rubber or the steel link bracelets combined with the brushed steel casing makes it wearable for any occasion. The watch also uses a sapphire crystal lens, resilient and resistant to scratches. The chronograph push buttons are ergonomically placed on a 45 degree angle allowing for better comfort on the wrist. The bezel made of a titanium alloy, combines a functional tachymeter and the distinguished SLR emblem. With two presses of the button, it is possible to measure driving speeds of up to 400 km/h. As far as mechanics go, the watch is powered by the mechanical TAG Heuer Calibre 17 movement with automatic winder via a central rotor, chronograph function and date display. And if it can’t get any higher end than that, the dials have been diamond tipped by hand. This watch will hopefully inspire the man who wants to look and feel distinguished, but also the one who just craves for a sophisticated watch. The Tag Heuer SLR for Mercedes Benz is available at all Tag Heuer authorized retailers. 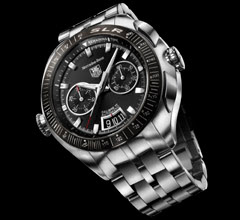 Check http://www.tagheuer.com/ for a complete listing. 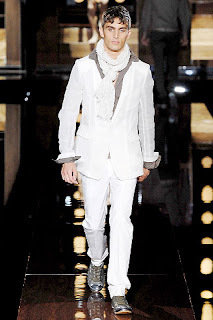 Spring 2008 is all about the Renaissance Man. 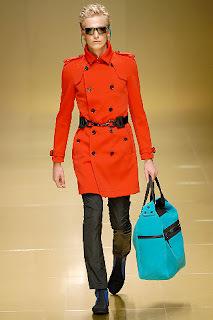 He can be best described as one who is REBORN with color, with pattern and with style. 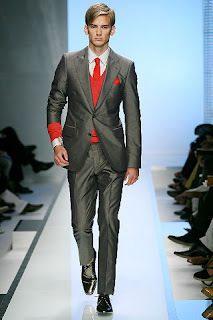 This season, men’s wardrobes will be dominated by eye-popping palettes, caressing fabrics, and modern lines. Our style will be inspired by rock, art, and sport. Guys, be prepared to awaken the senses. Here are my top 5 picks this Spring. Color, Color, Color. Go bright or go home. Complement a monochromatic piece (ie. black, grey) with a blast of neon. Yes, NEON! And real guys can work pink. Muliticolored patterns can be coordinated to create a balanced sense of style. SYNTHETICize. This season will see a resurgence of synthetic materials on the fashion runways. Majority of the items will be in accessories and complementary pieces such as jackets/top coats, murses (aka “man purse”), and hats. So be ready to spice it up with synthentics! The FLOOD is back. Not quite a full pant. Nor a short. The three-quarter length pant is back. In the past, guys thought this was a bit too “out there”. Not anymore. Capris have gone mainstream for both male and female fashion lines. 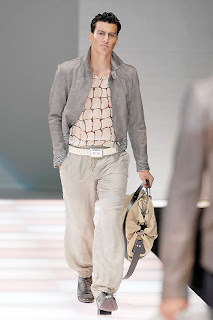 Spring 2008 will see guys dressing up this wardrobe essential with some serious hardware like skull necklaces, bracelets, rings and leather sandals. Layer with lightness. One of the top trends this season is layering. Light Layers. 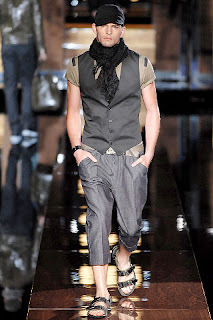 Linen pants, cotton blazers, light scarves, jersey t-shirts. Each layer provides additional warmth but not additional weight. Add the following pieces to your wardrobe to stay current : 1) a pair of white/cream linen straight leg trousers, 2) a light cashmere vest 3) a linen scarf in gray or beige 4) an unlined cotton blazer. It’s HAMMER time! MC Hammer’s sense of fashion has made a comeback this season. We will see various takes on the infamous “hammer pants. Alongside the baggy pants will come, fitted shirts and jackets, and a lot of accessories. As always, style is a personal thing. Know who you are. Carry your clothes with confidence. And mix and match to bring the best in you.